So in my last post I looked at what I saw that made up a MOOC, the content, the assessment, discussion, assignment and a bit about the platform and my experience on a MOOC. This post is going to explore (or ramble) about MOOCs a bit more, and on what the benefits and challenges that an institution may face in considering a MOOC. From the outside, I must admit that I see a lot of the current MOOCs as enhanced marketing – not that there is anything wrong with that. They are a business development device to help promote the main paid-for courses available at that institution. If someone likes the MOOC, they may want to pay for the full degree, or programme to study fulltime or even one of the distance courses. I imagine that these are also quite cost-effective as marketing tools, using existing (albeit repurposed) course modules for marketing the courses. I could see that even without a MOOC, a college could open a course area with a subset of the materials of the course in it, allow Google index it and give guest level access to it for visitors. When I think back a long time ago to when I was evaluating a college, it was mainly done from a one day site visit, word of mouth, recommendations from teachers and a paper booklet describing the course. I think back wondering how such little due diligence was paid to such an important choice. So at one level a MOOC is a subset of the new-version of that course booklet, helping to promote, demonstrate and explain the course and enable the user to experience it (or at least one module in it). I imagine that nowadays with students being consumers by paying big money per year, the consumer in them will even more want to get a taster before purchase. Although my last post talked about the massive amounts of content out there often published under Creative Commons licenses as open educational resources, this is not the case for every course and every institution. Well, Intellectual Property, or more specifically the protection of it is a complex area. Just as some teachers/lecturers/trainers believe they should not share their notes with others as it is part of their value they bring to the job; institutions sometimes are also troubled by sharing content, their IP, their USP (unique selling point). Some may perceive that putting something out there as creative commons, loses control on it to some extent and hurts them somehow. Now, you could argue that running a MOOC (where the user can download the videos, slides etc, for their own use) is also putting your content out there however the ones I have looked at retain copyright on the material and just provide for personal non-commercial use. So it is not re-usable elsewhere unlike creative commons. There is nothing at all wrong with this, and it does offer another way to have your materials out there and being seen by others but also keep “control” of them. Why would you want to have your content / course materials seen by the masses? Well, there are a few reasons. It can help make the institution or staff member look good – assuming the content is good. The institutions that have “gone MOOC” have had a lot of publicity often aimed at them being ground breaking in exploring the new learning delivery mechanisms, and the lecturers (who sometimes seem to release a Book just afterwards) are made more into public heroes increasing their profile and that of their course. Even if that institution was not MOOCing a module which suited a student, they are embracing the new paradigm which can only help improve the image and perception of that institution in the students mind. When a service is free, you are the product. So what about the MOOC “platform” enablers? Data is king. What types of Data does the platform get? So what could be done to monetise the data? Who would be interested in it? Of course, having done a MOOC means that a student is a “self-starter” who were motivated enough to find and do a MOOC. So of course of value to employers looking for people who recognise that lifelong learning is now a reality of the world of work. However, one of the comments on the Coursera announcement brings data analytics to the fore “I would like to know that unfinished courses in my profile won’t be looked upon negatively by possible employers”. So there will be a challenge to use data that is meaningful. So there will be a number of challenges there just as it brings opportunities. Like many others I guess, I signed up to two MOOC. I completed one and just browsed the other one out of interest as I would a book in a library or shop. Another option for monetising the data will be when colleges or some body (or the MOOC provider) starts offering certification exams for the same subjects/curriculum. Obviously this would need identity management and other aspects thrown into the mix, but if you have a few hundred thousand students who completed a course – how many would bite at a full certification based on the same curriculum – which they could use as credits towards a greater goal perhaps. There are other areas I believe that could be monetised, but probably said enough about this for now. But in short, the data in a MOOC provider potentially has further value to the provider and partner companies. There is a use case that I believe is worth some attention however, and that is where I imagine a “MOOC” module will be of value. I mentioned above where in some ways a MOOC is like the modern-day printed booklet about a course, providing a more hands-on insight into a course and subject area for a potential student. There can be many reasons for students to drop out of college. Normally these include practical real life reasons such as financial and also lack of interest or loss of interest in the course, perhaps they take the wrong course or even they may not have been prepared for the commitment required for the level of study. Consider a scenario where all the universities running one module from their top 20 courses as yearlong MOOCs (or just self-paced modules). These are then made available to schools to give students in a transition year, or to those students who are starting off on A levels / Leaving Certificate / Pre-university exam years. This can be aimed at time that they will complete one or two perhaps to help assess if that subject is really one they want to invest four years of their life learning, and if that type of learning is something they would like to do rather than something else. How much would this reduce drop-outs? I have no idea, but I can only surmise that it must be able to help. How would I suggest achieving it? 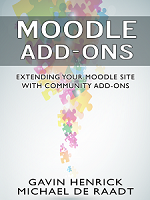 An institution could set up a dedicated Moodle site, with just the features enable they intend to use in the courses. Heavily branded of course, this is marketing after all. Then they could have either self-enrolment letting students enrol for courses on an ad hoc basis, or be more structured and use IMS LTI to share the courses with various local schools (or any that apply) so that they can connect their Moodle, Sakai, Blackboard or Canvas to it to enrol the students en mass. How many students not dropping out would it take to pay for the cost of implementing this? Not many I guess. Some interesting blog posts that I have read recently. Wow! Excellent post Gavin (and the previous one too) – and lots of food for thought there. I am signed up for an ELearning MOOC starting shortly – I think half of twitter is signed up too actually – and I am very much looking forward to this new experience not only from the learning side but also from the potential creation of MOOCs side too. Hmm..
Pingback: My initial thoughts on FutureLearn « Whose Education Is It Anyway? It is very interesting post. As for me MOOCs will be really useful when it is will be possible to do some practice training together with theoretical learning on course. How do you think this will be solved? Local groups of MOOC students will join and together find how to practice? Or MOOC vendors will agree with companies in different locations to do internships for their students?